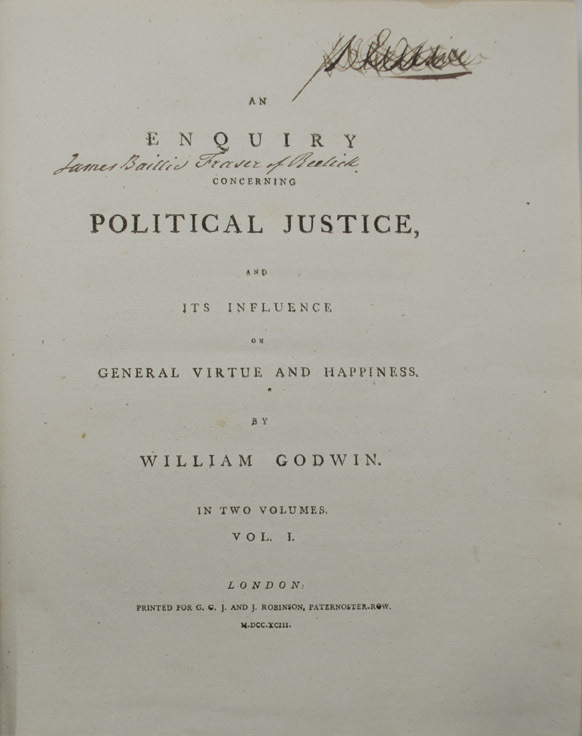 First Edition of Godwin's Work on "Rational Man"
GODWIN, William. Enquiry Concerning Political Justice. and Its Influence on General Virtue and Happiness. In Two Volumes. London: G.G.J. & J. Robinson , 1793. First edition. 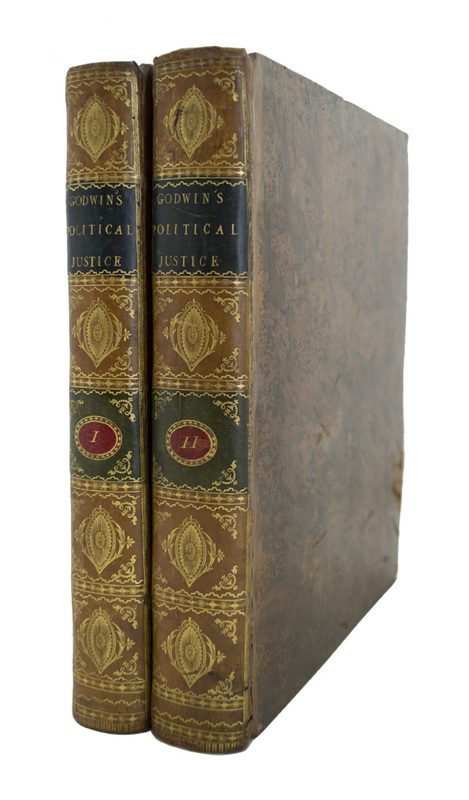 Two quarto volumes (10 5/8 x 8 3/8 inches; 269 x 214 mm.). xiii, [1, blank], [19, contents], [1, blank], 378; , [23, contents], [1, blank], -895, [1, blank], [2, errata and directions to the binder] pp. Complete with half-titles. Contemporary tree calf. Spines stamped in gilt in compartments with two morocco gilt lettering labels. One in black, the other in green with a red inlaid oval. Board edges decoratively tooled in gilt. Edges dyed light yellow. A bit of scuffing to boards, edges and corners a bit rubbed. Volume two with a minor crack to bottom of front hinge, but still holding firm. Volume I with minor worming to front pastedown, and which extends for the next three leaves at the innermost margin only and just barely touches the half-title. Previous owner James Baillie Fraser old ink signature on title-page of each volume. Other previous owner's signature on top of contents page of volume II and scratched out at top of title-page of volume I. Paper flaw to top margin of page 859, not affecting text. Previous owner's notes and line through the word "Obedience" in the running titles on pages 186-189. Overall, an excellent, very internally clean copy. “The Enquiry was, and remained, the work by which [Godwin] was best known. It was one of the earliest, the clearest, and most absolute theoretical expositions of socialist and anarchist doctrine. Godwin believed that the motives of all human action were subject to reason, that reason taught benevolence, and that therefore all rational creatures could live in harmony without laws and institutions. Believing in the perfectibility of man, he thought that ‘our virtues and vices may be traced to the incidents which make the history of our lives, and if these incidents could be divested of every improper tendency, vice would be extirpated from the world’. All control of man by man was intolerable and ‘government by its very nature counteracts the improvement of original mind’. The time would come, he maintained, when every man, by doing what seemed right in his own eyes, would also be doing what was best for all men, because all, through discussion, would be guided by purely rational principles. Natural relationship had no meaning—marriage and parental duty were alike irrational, and property the worst form of tyranny. It is to be doubted if anyone fully accepted this out-and-out radicalism, but Godwin’s passionate advocacy of individualism, his trust in the fundamental goodness of man, and his opposition to all restrictions on liberty, have endured” (Printing and the Mind of Man). Provenance: Previous owner James Baillie Fraser was a renown Scottish travel writer and artist. Kress B.2529. Goldsmiths’ 15825. Printing and the Mind of Man 243. Rothschild 1016.